Learn about moderation tools on this page. Many of the tools here require specific privileges in order to use them, this guide will assume you have those privileges. If you do not, some tools might not be available to you and you should discuss it with your room’s owners. Learn more about privileges here. How does Flockmod’s moderation work? Flockmod’s moderation uses IP addresses to assign moderation actions appropriately. Every user connected to the internet is assigned an IP address, and every site you visit can see your IP address. Flockmod allows its moderators (with the correct privileges) to see its user’s IP addresses in order to keep their room safe. When any moderation action (mutes, kicks, or bans) are taken, Flockmod uses IP addresses to assign the action to the user. If you are a moderator and have the correct privilege, you can see a user’s IP address by right clicking on their name in the userlist or by checking “Show user events” in the configuration menu; their IP address will appear next to their name in the chat when they enter and leave. You must have “Show user events” enabled to find a user’s IP address after they have left the room, so it is highly recommended have it on. So what can I do if there is a user I don’t want in my room anymore? Mute:Muting a user will completely restrict their board access for 2 hours by default, however the user still may chat. Mutes stay active even if the user leaves. Kick: Kicking a user will remove them from the room, they are able to join back. Ban: Banning a user will completely restrict their ability to enter the room for 24 hours by default. 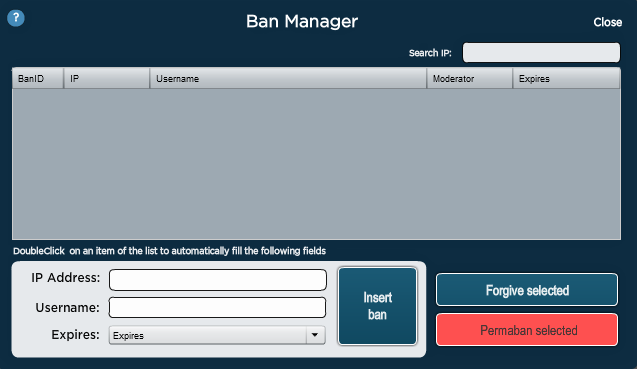 Their information will automatically be inserted into the Ban Manager. Once the userlist context menu is open, you can press “k”, “b”, “m” or “u” on your keyboard to quickly give the command. What if I ban a user by mistake? You would need to pull up the ban manager found on the bottom bar as a ‘restricted’ icon or through the “…” menu. Once here you will see everyone who is banned from your room, find the username or IP of the user you accidentally banned, select it, and press ‘forgive selected’ and the user will no longer be banned. Ban ID: This will tell you the ban ID that the user banned has. The IDs are global, meaning no banned users will ever share a BanID no matter the room. IP: This is the user’s IP that they are banned under. Username: This is the username they were under when banned, or the username a moderator entered if the ban was manual. Moderator: This will show the moderator that banned the user. Expires: This will show the year/month/date/time the user will be unbanned. Search IP: Search the ban manager for a specific IP. IP address (input): Enter the IP of the user you want to ban. Username (input): Enter the username of the person you banned. Expires [dropdown]: Once you have an IP and username set, you can change the amount of time you want the user banned for. By default it is 24 hours, but you can ban a user longer than that using this. Forgive selected: This will unban the user selected. I got banned? What did I do? If you got banned from a room, you have probably broken one of the rules of that room. Each room has different rules and can be moderated however the room owner sees fit. If you think you were banned by accident, try sending a mod an inbox to explain the situation. Otherwise you will have to wait out your band duration, which is 24 hours by default. A banned user keeps coming back, why is this? Since Flockmod bans by IPs, if a user changes their IP address they may be able to re-enter the room. Some users have dynamic IP addresses, meaning they can change it whether intentional or not; usually only a part of their IP address will change. Normally dynamic IPs can still be banned, because they share a range. However just because two IPs share a range does not mean it is the same user. To dynamically ban an IP, copy the banned IP into the IP address slot. You will want to put asterisks where the part of the IP is changing. Below is an example, the asterkis mark which parts of the range will be banned. If only the last part is changing, only put an asterik on the last part. Be careful doing this and use it sparingly, as you are banning whole ranges of IPs, which means more potential users are being banned. You also may want to consider raising the ban length to show the user ban evading is not allowed if the user doesn’t stop. If you encounter a troll who is causing a real problem out of your control, contact one of the global moderators via inbox. RDNS is reverse DNS. The RDNS of a user is found in the chat after you or the user enters if you have “Show user events” checked in the configuration menu. In short, it is a helpful way of backtracking IPs to spot patterns with dynamic trolls. Similar RDNSs do not mean it is the same user, only that they share a region/isp. Users with ranks and the privilege to undo have an undo panel. It is located on the bottom bar as the reverse arrow or in the “…” panel. Save the board every __ seconds: This will save the board every specified number of seconds, if you have the number “2” in the slot, it will capture the board every 2 seconds. The higher this number is, the more frames that can be saved. but will cause you to be less precise when undoing. With a limit of __ saved boards: The amount of saved boards, a higher number is a further undo history. Partial undo: This will allow you to undo part of the board, rather than the entire board as when unselected. – Box: If you have box selected, anything inside the box will be undone. 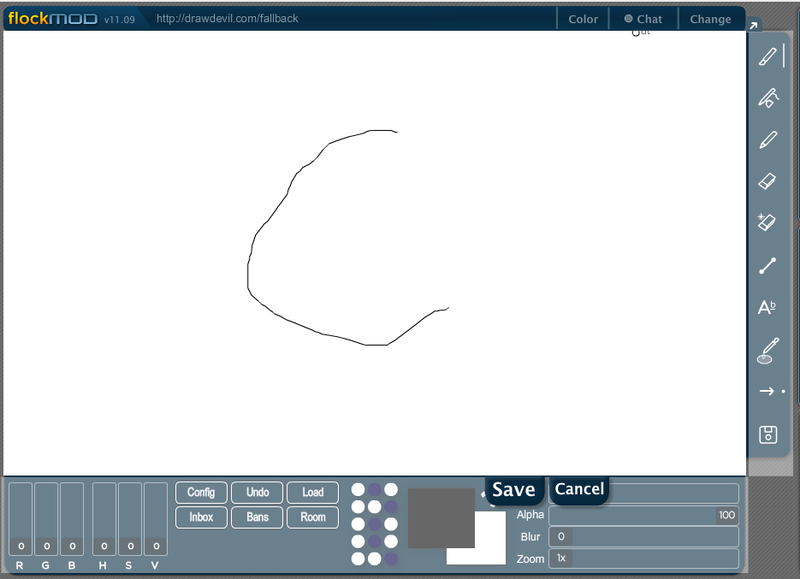 – Lasso: If you have lasso selected, you can freehand the area you want undone. Layer 1, 2 and 3: The layers selected will be the layers undone if you are in a layered room. Saving a frame You can save a frame by right clicking on the undo screen on the frame you want to save. 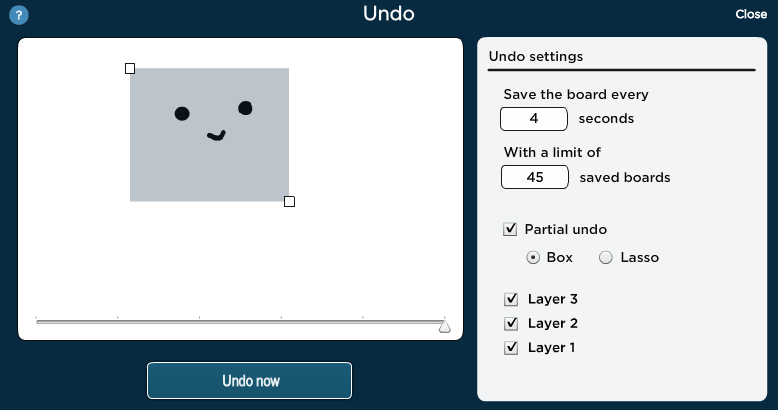 Quick Undo: You can quickly undo the board a few frames using a shortcut. You must first assign the shortcut in the shortcuts manager. In order to upload a picture onto the board you must have the correct privileges for the room you are in. Once you have the privilege check the bottom bar for the picture icon, or use the “…” panel to load a picture. Once you’ve done this your file explorer will open and you can select a picture to drag around the board. Once it is in the spot you want, hit confirm and it will load onto the board. If you’re in a layered room it will load onto the layer you’re currently on. The max file dimensions that can be loaded is 910 x 640. What are ‘modhax’? And how can I use them? Modhax is an anti-trolling feature available to moderators and above. 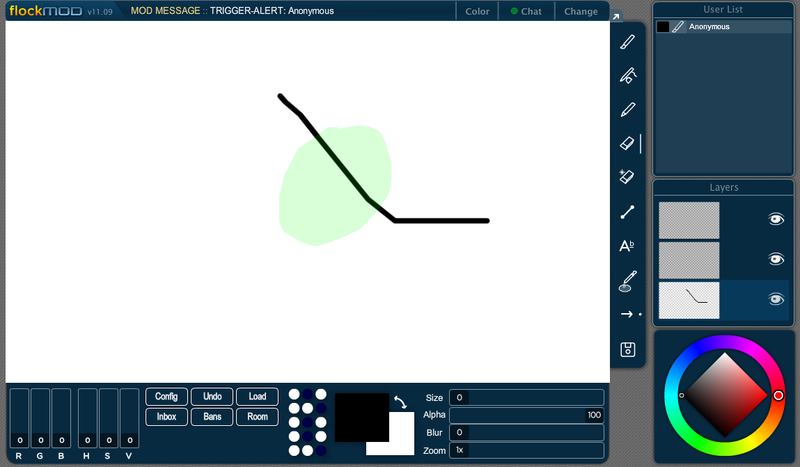 It allows you to freehand select an area of the board as a trigger zone. Anyone who draws in that area will have your picked action applied to them. Mute: Mutes the user, this is denoted with a tan trigger zone on your screen. In addition to these actions, you may also specify that the board needs to be undone afterwards. 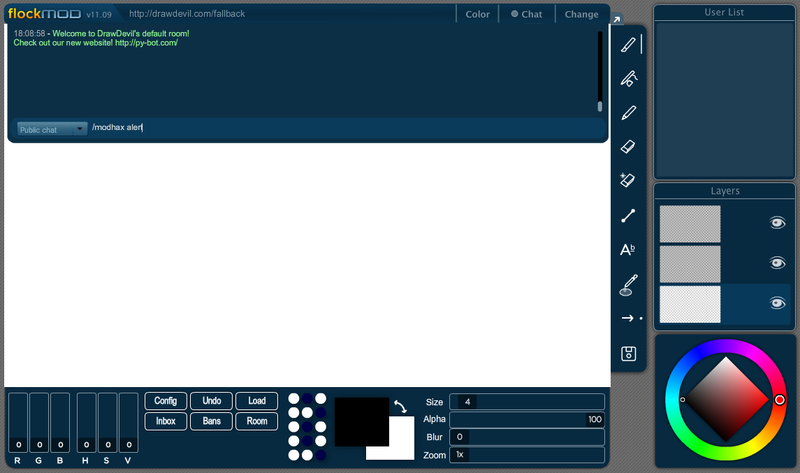 After hitting enter, the chat should disappear and a freehand selection dialog should appear. 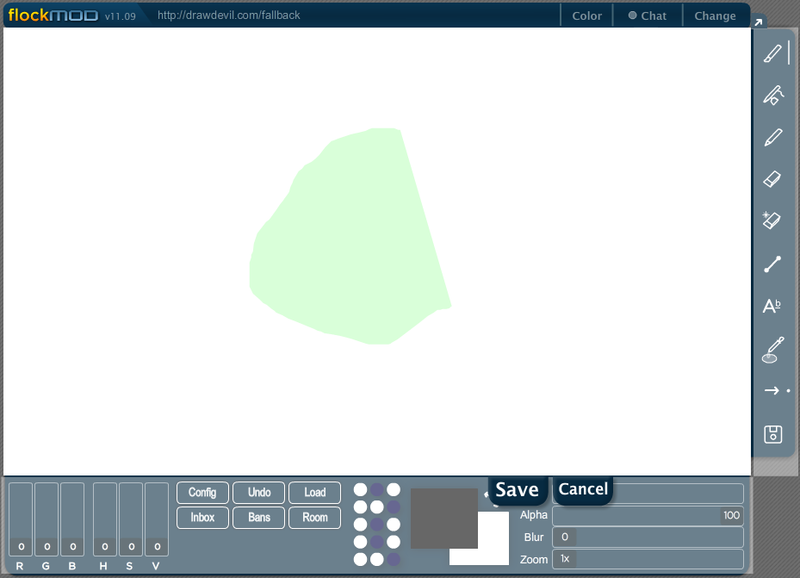 Outline the area you would like to set as a trigger zone with it. 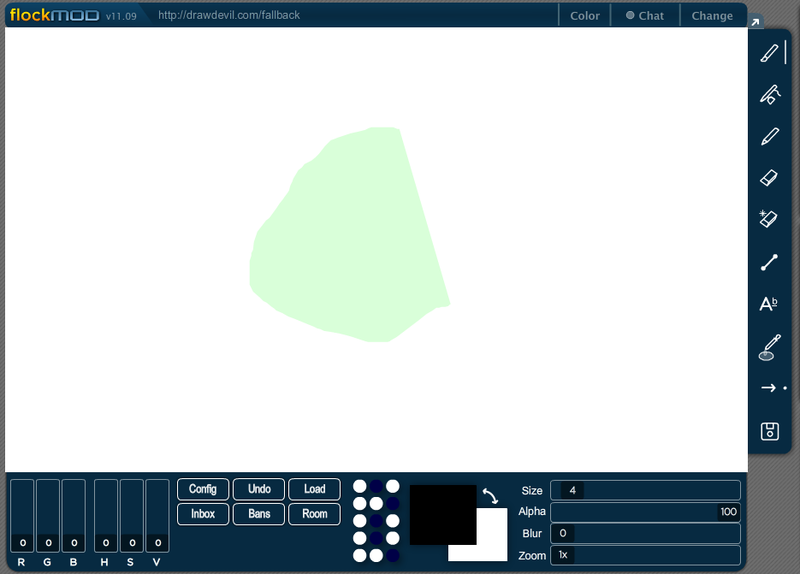 Once you have outlined the area, it should appear in color. Hit save to lock in the zone, or redraw it if you arent happy with how it turned out. Your trigger zone is now locked in and active! When someone draws on it, it should now fire off the action of you choice. To unset modhax, simply type /modhax on its own. You may also right-click a user in the user list, then click “Pardon from modhax” or “Unpardon from modhax” respectively to make the user immune/susceptible to your trigger zone. This allows you to set up a space for yourself, an artist, or a small group to draw uninterrupted if desired. Are there any other ways to catch a specific user causing trouble? When a user has their mouse down on the board, their tools blink in the userlist. This is useful for finding a scribbler whose name moves too fast to see.